This article originally appeared in Metal Hammer #250. IT WAS ELTON JOHN THAT GOT ME INTO MUSIC. I wish I could remember which song it was. He was the first artist I started listening to and he’s one of the greatest of all time. Great song writing, a lot of feeling, amazing lyrics… even before I understood what it was about. RED CARPETS ARE ALWAYS WEIRD, IT’S ALWAYS UNCOMFORTABLE. It’s cool that your peers or your fans or the industry recognise you. As far as numbers and winning awards, that’s nice, but it ain’t why I do this. We’ve had a lot of success and I guess those achievements speak better than a hunk of plastic or metal that sits on your mantel. IF YOU’VE FOLLOWED US OVER THE YEARS YOU’LL GET OUR SENSE OF HUMOUR. You’ve probably seen us making asses out of ourselves on Headbanger’s Ball, and I think any band can relate to that. We’re not the cornerstone on having a good time or being smart asses! I guess everybody took the music very seriously, even though we didn’t take ourselves as seriously as we took the music! That certainly came across with all of the bands of our era and it wasn’t just in Seattle, it was all over the world. I DON’T EVEN REMEMBER THE FIRST GUITAR I BOUGHT. It was maybe a Korean-made Strat from a swap meet. I bought my first real guitar on payments when I was working in a music store in Texas – I was about 18. I still have it. It’s the one most people recognise me playing – a 1984 G&L Rampage. WE STARTED DOING ACOUSTIC STUFF EARLY IN OUR CAREER WITH SAP AND JAR OF FLIES. That was a side of music we explored early on, and people accepted that. If you take away the amplification and the distortion, there’s some really strong, simple songs. Any band should ask if you take everything away, does it still work? And that tells you whether it’s a good song or not. Take away all the tricks and special effects, is it still a good song with just a voice and a guitar? I USED TO JAM WITH GUYS WHO WERE FAR BETTER THAN ME. Probably because I was always interested in learning and getting better, so I’d try to learn from them, and it seemed to work out pretty good! They were a couple of years older than me, maybe had a band and had done gigs, and I’d hang out with them until I was on their level or surpassed them, just absorbing as much as I could. Then when I felt it was time to move on, I’d do that, until I met the guys in Alice. GRUNGE WAS NEVER A POPULAR WORD FOR ANY OF US FROM SEATTLE. Before that word, it was referred to as the ‘Seattle Sound’, and I liked that because, although we were all unique, there was definitely a kind of ethos, a bunch of kids making noise and playing bars and parties. All the Seattle bands shared that, because it was such a small town and we all went to each other’s gigs and hung out with each other. WHEN I WAS A KID I WANTED TO BE ANGUS YOUNG OR ACE FREHLEY. Kiss get a lot of flak, it’s very fashionable to slag them off, but I think they were a very important band in rock history. They certainly were for me, when I was younger. They had good, basic rock songs, and nobody had that larger than life persona. For a young kid that was an important period. Those old records have some amazing songs. EVERYBODY’S GOT A LITTLE BIT OF A DRIVE TO BEAT MORTALITY. Whether it’s having kids to live on after you or whatever. I don’t know if our music’ll be around forever, but it’ll probably be around for longer than me! A lot of achievements are based on that primal urge I guess. I’m glad people still dig it, and I’m aware of how rare that is, especially to get second chances. It’s funny to think the thing that you did to avoid having a job became your life’s work… the thing you created with your friends all those years ago took on a life of its own. You continue to give it life by recording and touring, but it’s kind of its own thing. 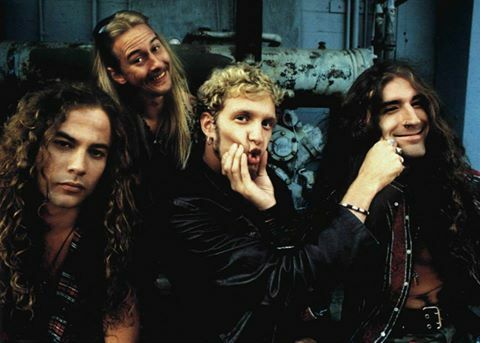 A good example of that is when our band was very inactive when Layne passed. We weren’t around, but the music was still out there. This entry was posted in Alice in Chains and tagged ace freshley, acoustic songs, alice in chains, angus young, awards, elton john, grunge, guitar, headbanger's ball, jar of flies, jerry cantrell, kiss, layne staley, mike inez, mike starr, sap, sean kinney, seattle, seattle sound. Bookmark the permalink.